It should come as no surprise what I say when I get a Goody Beads package in the mail! Yup. " Goody!" Last time I featured their wonderful European leather bracelet findings. 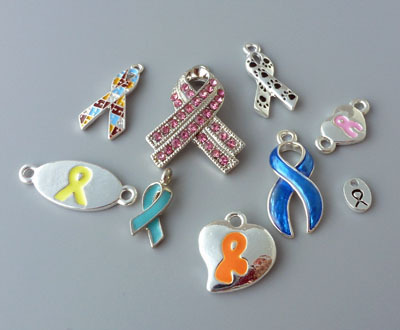 This time round, I will be featuring their amazing collection of awarenesss charms as October is the month for not just breast cancer awareness but many others such as autism, brain tumor, pregnancy and infant loss and so on. Some of you do raise money for worthy causes so this post will hopefully inspire! 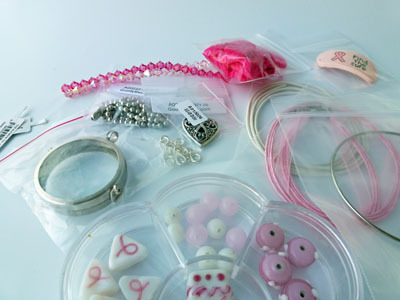 Goody Beads sent me several charms for review. They also have a good resource guide which shows you what the different colored ribbons mean - but be aware that pink is not a color for testicular cancer. Note there are often several causes for a single color. I also received a mixed collection of findings and beads to work with. 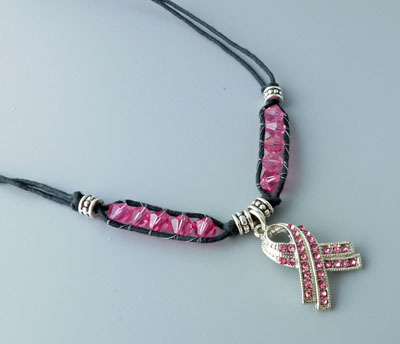 I picked the pink crystals and the beautiful pink crystal ribbon to create the cord necklace. Black is a good contrast for the brighter pink hue. 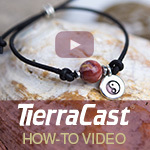 I used the popular wrapped leather and bead technique which is usually seen on bracelets for the crystals (see tutorial link below). Short sections do make the focal area more visually appealing. It is now in my Etsy shop where 100% of the net proceeds will go to cancer research. I was also quite taken with the bangle finding in the Goody Beads stash. I had never come across this adjustable style before. It's thicker than memory wire but there is no need to finish the ends because it is already prefinished. Beads cannot be strung on. 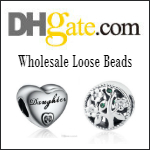 It is style #z009516 on the Goody Beads site - a 6 inch expandable silver finish wire bracelet with catch. 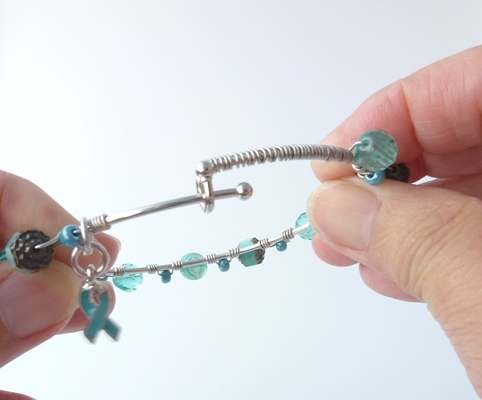 All I did then was to do some simple wire wrapping of different teal beads and added a small teal ribbon. Teal is the color for ovarian cancer awareness as well as polycystic kidney disease, anti-bullying and so on. The bracelet opens up by sliding apart as shown below. So putting it on and taking it off is very easy! If you'd like to win a $50 gift certificate from Goody Beads, please make a comment below. 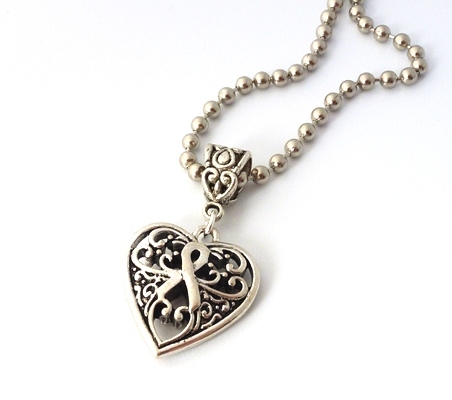 Note the giveaway is not just for awareness charms but for anything in their store so do browse. 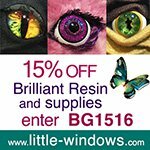 They have a $5 discount especially for readers - use coupon code BGFIVE. Make sure you leave contact info below if you do not have an online shop or blog. It ends in a week's time at 6 pm EST Monday, October 14, 2013. I will pick the winner randomly and announce the results as soon as possible after. So be sure to leave a contact email if you don't have an online link or make sure you come back and check! Otherwise I will redraw in a week. Good luck! What great charms and ideas. I'd love to get some of their charms and beads. I'm a blog follower already. I love Goody Beads! 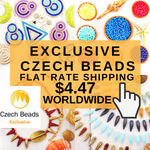 One of my favorite online shops. The pink and black necklace is really cute. Ooohh...goody!! I love what you created from the supplies you received & my mind is already buzzing with ideas of my own. 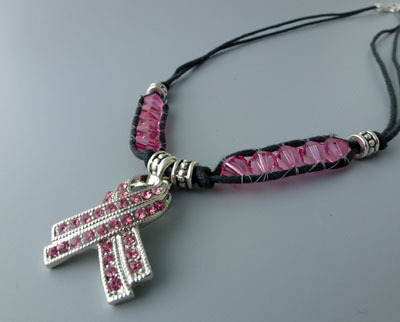 Like you, I would make something pink & donate the money from the sale to breast cancer research (I'm a survivor). 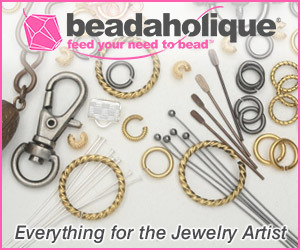 Bead shopping is difficult in my corner of France, so I'm always looking for new online sources for beads, so I'll check out Goody Beads. Another great post. I love goody beads. I am a blog follower. 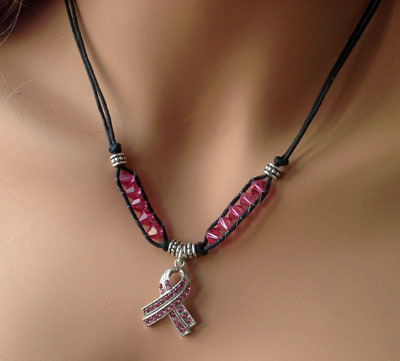 Love the breast awareness necklace. I absolutely love the adjustable bracelet and what you did with it. That's one I'll have to try! I'd love to win the gift certificate to pick up the bracelet and a few beads to go with it. Also, the necklace idea is great; I've been looking for more ways to use cording (leather and otherwise) in my designs. Thanks for the offer!!! I subscribe to your blog and will mention this on Facebook. Awesome! I love Goody Beads and would love to win a GC! Thanks for the chance! I am also a blog follower. I thoroughly enjoy reading your blog! Thank you so much for all that you have shared! 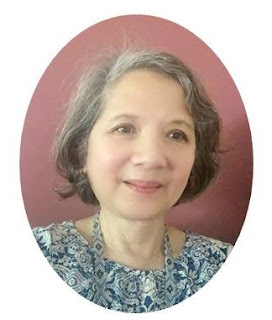 I so enjoy reading your blog - it's so informative and interesting - learned many a new thing from you! Would love to win this gift certificate....can't have too many beads! Love the bangle. I have always found bangles to be too big for my wrist but this one addresses the problem. As always; love your designs and your commitment to a cause so close to your heart. Miss you here in Dartmouth. Love the charms, very cute. And a bead giveaway...awesome. Thank you for highlighting all those great projects and designs. You really have a "Good" eye for "Good" Beads. Goody Goody for the Giveaway. I love goody beads....I have a pen that I made with lampwork beads from them. I love your blog also. I hope I win. I sure hope they have candy charms Pearl - that way I can say "Goody Goody gum drops!" Sorry - I just had to. You always have great ideas. Would love to get a gift certificate to Goody Beads...I love Goody Beads!! I've enjoyed your blog and have bookmarked it to read further and get inspired!! I love Goody Beads, Too!! I love these products & ideas. What an awesome treat to win a $50 voucher! Been so long since I coulld afford a bead/craft spree! Thanks guys:) Keep up the good work! what lovely charms and designs for some excellent organisations. Wow, the idea's you can come up with! Would love to win these beads. I can always use new beads. So cute! Those teal beads are right up my alley! I love the stash you received. That bangle bracelet is really nice. The awareness charms are lovely too. I would love to win the gift certificate. Love this giveaway...the necklace is lovely. Would love to win this...I love your blog. Thank you for another great giveaway offer. Who wouldn't love to win this? Forgot to say I am a blog follower! I too love Goody Beads! A great online resource. Thanks for hosting this great giveaway! I love beads. 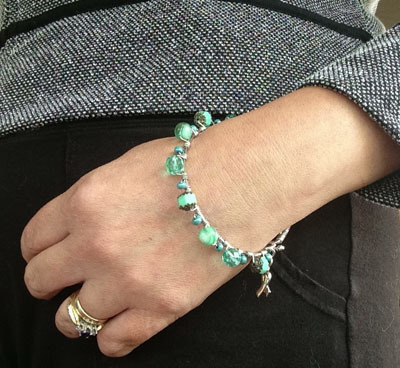 Love that aqua color you used in the bracelet. SO pretty! Thanks for the chance to win. Lot's of neat things to use! You get to try out the best stuff - love your job! Thanks for the opportunity to win. I am totally in love with the blue bracelet and the pink necklace. I have cancer survivors and other family members that lost their battles to one of our world's cruelest diseases. Thank you for sharing the awareness. I am a subscriber and I am passing this on to everyone I know. Love the pink awareness charm, thanks for the chance to enter. ooooooooo, pick me, pick me!!! I love Goody Beads and would love to win a gift certificate! Pearl, I love both of your designs. Thank you for this giveaway. I love that pre made adjustable bracelet. 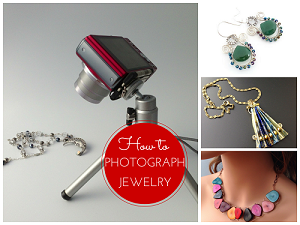 It makes it so easy to whip up bangle in no time! I would love to win some beads! I love Goody Beads! I am especially fond of their Mirage Beads! Love the stash that you featured. Goody Beads has a great selection. Thanks for your great blog! I would love to get a giftcard, and love the items you made! Wow, such beautiful designs, and charms. I love the fact that this jewelry has a beautiful message as well. I just love Goody Beads. They have findings that I can't seem to find anywhere else. I shared the contest through Twitter. Goody Beads is one of my go-to shops! Fun selection! 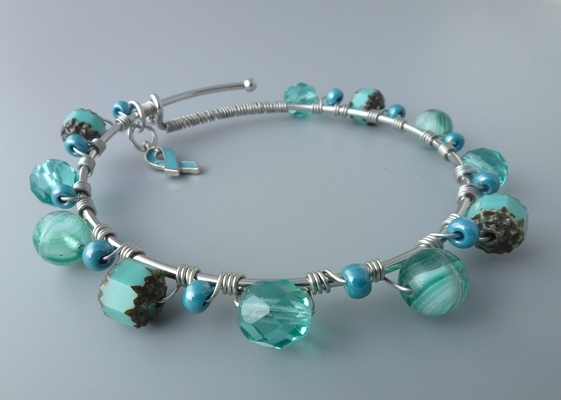 Love the silver adjustable bangle with the turquoise beads. I have experimented with copper wire, and made one of these bangles (very crudely, just for me & only a few beads). Have enjoyed the bracelet and it hasn't even turned green, lol. I'm a subscriber and love your site. Love the teal bracelet. How cool to have a giveaway like this! Thanks! I am looking forward to learning more about Goody Beads! awesome!! Thank you for the opportunity to win! I love the leather necklace! Love the necklace. I've been looking for beads for cancer. Thanks for sharing. Beautiful charms and beads. I love the way these beads were used. I would love to win. I've been beading my whole life. Would love to use those charms in my beaded bracelets.